Goats are known for their tendency to buck and kick. Goat cheese, however, tastes best when you add a spicy kick. 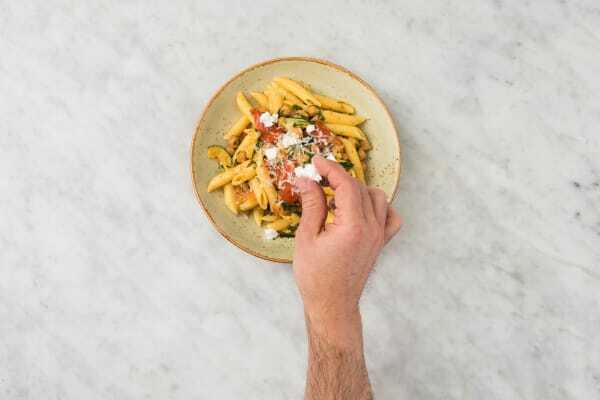 This pasta recipe with crumbles of the stuff weaves in a sprinkle of hot chili flakes to make it a little feisty. 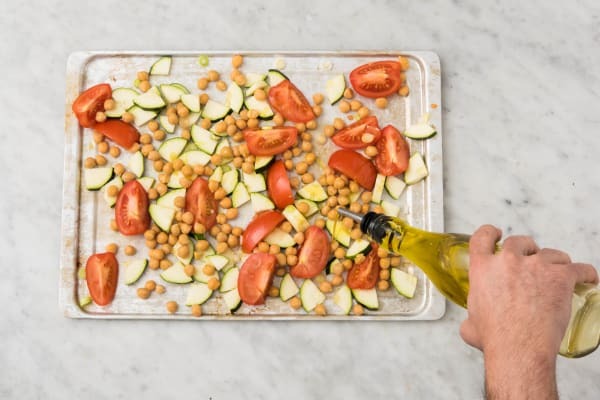 But there are roasted veggies and chickpeas, too, to ensure that every bite is filled with hearty, cozy wholesomeness. Wash and dry all produce. Adjust rack to upper position and preheat oven to 450 degrees. Bring a large pot of salted water to a boil. Cut zucchini lengthwise into four wedges, then slice crosswise into ¼-inch-thick triangles. Quarter tomatoes lengthwise. Trim, then thinly slice scallions, keeping greens and whites separate. Thinly slice garlic. 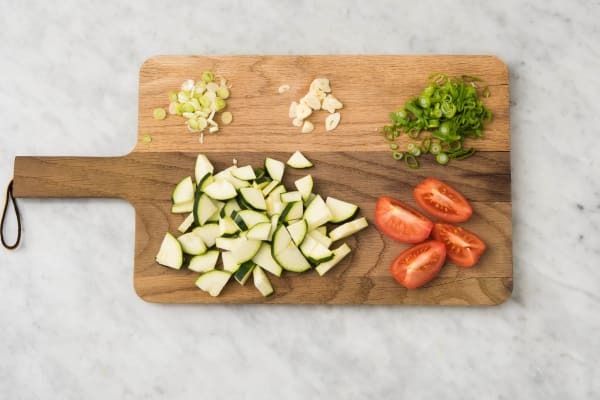 Spread out zucchini, tomatoes, and scallion whites on a baking sheet. Drain and rinse chickpeas, then add to sheet. Sprinkle with a couple large drizzles of olive oil. Season with salt, pepper, Italian seasoning, and ¼ tsp chili flakes (use less to taste). Roast in oven until zucchini is tender and tomatoes are soft and wilted, about 25 minutes. 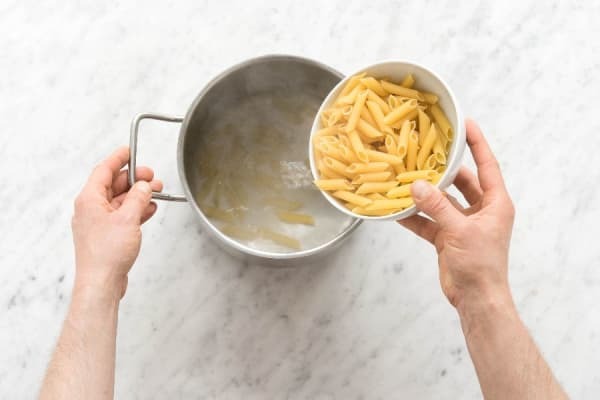 Once water is boiling, add penne to pot. Cook, stirring occasionally, until al dente, 9-11 minutes. Meanwhile, pick basil leaves from stems. Reserve a few leaves for garnish and roughly chop the rest. 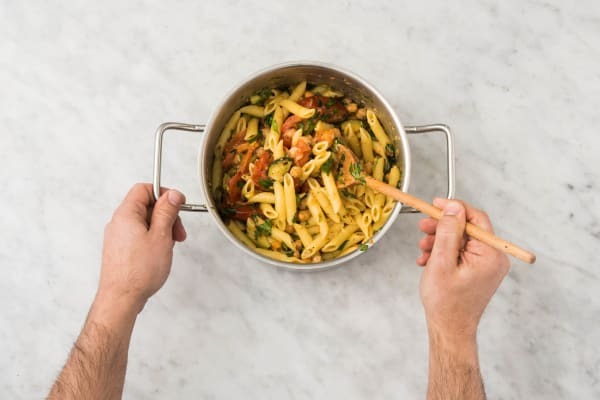 Carefully scoop out and reserve ¾ cup pasta cooking water. 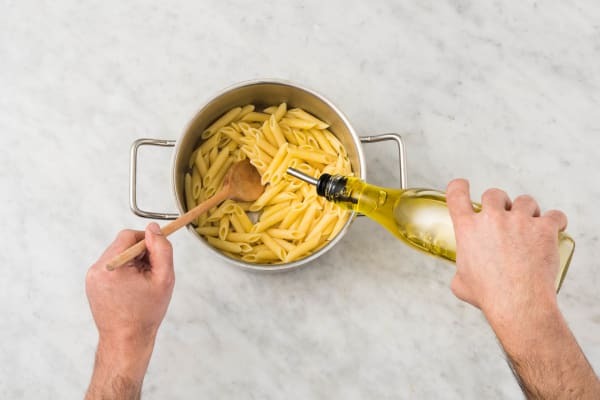 Drain penne, then return to pot and toss with a drizzle of olive oil. Once veggies are done roasting, add to pot with pasta. Stir in chopped basil, half the Parmesan, and 2 TBSP butter. Season generously with salt and pepper. 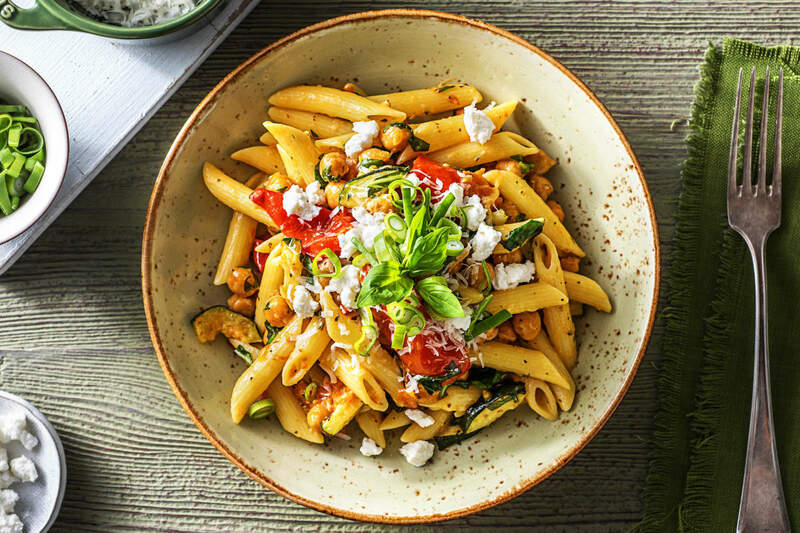 Add just enough pasta cooking water to coat everything in a loose, creamy sauce—start with ½ cup and add more from there. Divide pasta mixture between plates or bowls. Sprinkle with remaining Parmesan. Break up goat cheese into crumbles and sprinkle over top. Garnish with scallion greens and reserved basil leaves. Finish with a drizzle of olive oil and sprinkle with additional chili flakes, if desired.